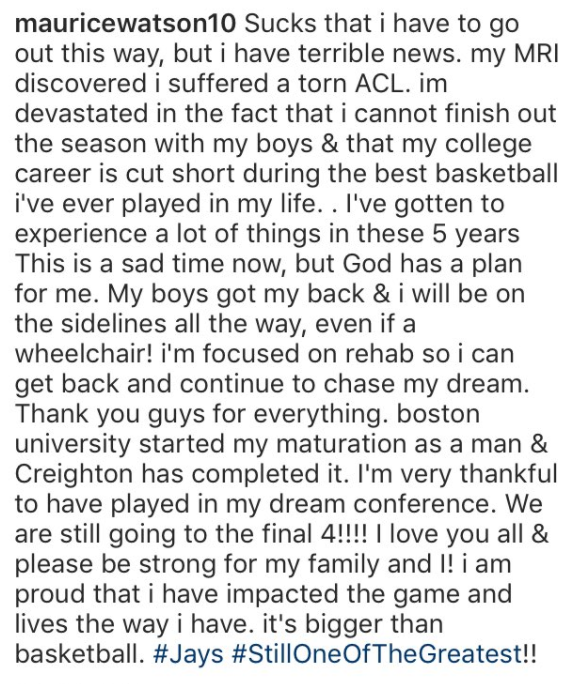 During Monday’s Creighton-Xavier game, Maurice Watson Jr. banged knees with a Xavier defender and collapsed in pain. After spending a few minutes on the bench, Mo returned to the game. After one of his trademark layups in traffic, he landed on his left foot. His leg buckled under what was confirmed yesterday to be a torn ACL. The storied college career of one of the best point guards in the country came to a sudden end. Mo took this bad news as best as anyone could. As Crighton coach Greg McDermott said today, this was a kid who was on his way to a few All-American teams this season. At the time of the injury Mo was leading the country in assists, was the active career leader in assists by over 200, and made his way to 9th on the Creighton career assists list despite only playing one and a half seasons as a Bluejay. The team had also shocked college basketball by reaching #7 in the country with a 17-1 record – the only loss coming to reigning national champion and AP #1 Villanova. The Bluejays are one of the most fun teams to watch in college basketball, and the excitement began with their point guard. Maurice has been one of the most important people I have ever known since our first encounter back in my freshman year at Boston University. It is because of Mo that I was lucky enough to get picked up by BU Athletics and become a college basketball announcer. It’s because he teased/teases me that I don’t really need my wheelchair that I was able to bounce back from the most intense broken leg I’d ever suffered. It’s because of Mo that I made my first real friend in college, and he helped me make a lot more. The news that Mo tore his ACL was devastating to nearly everyone. I’m selfish because he’s one of my guys, and I’m the one that’s supposed to hurt his legs. But something beautiful came yesterday, something that had to have brought a smile to Mo’s face even in the wake of the most painful news possible. The ultimate compliment came in the support from opposing players, coaches, and fans wishing Mo well and a speedy recovery. Big-name personalities like Jay Bilas, Scott Van Pelt, and Doug Gottlieb expressed their disappointment that Mo was out for the year. But the same caveat was attached all around. This was bad news for college basketball. On Unbreakable I like to try and be optimistic when possible, and this point above is one that I hope will be the silver lining to an otherwise unfortunate day. A few years ago I sat with Mo as we talked about his decision to transfer to Creighton to prove to the world that he could play at the very highest levels of the game. As personally disappointing as it was to see him leave Boston, I knew he knew that he would be able to prove himself in the Big East. We are roughly two-thirds through the season now and the Creighton Bluejays are an honest to god championship contender because they are one of the most dangerous offenses in the country. That’s because Maurice Watson Jr. made other teams terrified. He had an assist rate higher than Lonzo Ball of UCLA, and Ball is a top-5 NBA Draft pick this year. But let’s come back to that statement above again. This is bad for college basketball because Mo is done for the year. This is bad for college basketball because one of the best, most entertaining, most valuable, and most beloved players in the country won’t be taking the court again this season. At first glance that’s disappointing. But I like to believe that this is a day of confirmation that Maurice was right all those years ago. Mission accomplished. Injuries heal and life goes on. Mo’s time as a Bluejay might be coming to a close, but there is a long, long future in basketball awaiting one of the best players and friends in the game today.